International calls to the CIS countries, including Belarus, are very expensive. At the same time, the tariffs for local calls via a cell phone are cheap. This has been the precondition for the active development of the VoIP termination business sector in Belarus. The businessman, who makes the decision to buy voip gateway Belarus, gets the opportunity to earn large sums on the difference in the price of international and local calls. During the traffic transmission through VoIP and converting it to the GSM format in Belarus, originator companies pay an average of $0.27 per minute. In cooperation with transit operators you can organize a daily flow of live traffic of 5,000 minutes. As for the attitude of the state to VoIP termination, everything is very seriously. The government considers that the transit of gray traffic causes significant damage to the economy of Belarus, in connection with large monetary losses of GSM operators. Hence the President issued the decree "On Improving the Transmission of Telecommunication" in March 2016. It provides for tougher measures to prevent illegal international traffic. This refers to the intense work of antifraud systems, blocking suspicious numbers, as well as the establishment of a national center for the exchange of traffic database means (VoIP GSM gateways), which are used for termination. Devices revealed during the test calls will collate on this basis, and if they are not on the list they will be considered illegal. This may be the reason for the arrest of the owner of gsm to voip gateways. On the forums, you can find reviews of entrepreneurs who talk about the persecution of terminators by members of the KGB. The maximum duration of "life" of the SIM-card, according to the same reviews, is 3 days. Antifraud systems in Belarus are divided into two types - passive and active. The passive system works using a statistical analysis of user behavior (number of calls, the caller's unusual activity in the night/day, moving around cell base stations, and so forth.). The active systems, so-called "calling ones", which make test calls to suspicious numbers. If there is any illegal route of the call, the SIM card is blocked immediately. In Belarus, mobile operators also practice tracking Internet traffic, which in many cases are also Internet service providers. When a voice termination is revealed, traffic flows are blocked. Entrepreneurs working in the Republic of Belarus note that the state especially watches users, who use the high-speed internet and a large amount of Internet traffic daily. GoAntiFraud offers great opportunities for GoIP equipment users by EjoinTech & ChinaSkyline, Topex who do GSM termination. We provide efficient tools for the protection of SIM-cards from AntiFraud systems so your business will make more profits. You can buy a standard GoAntiFraud license or take advantage of our offers NewBusiness for beginners and Corporate Solution for GSM termination professionals. 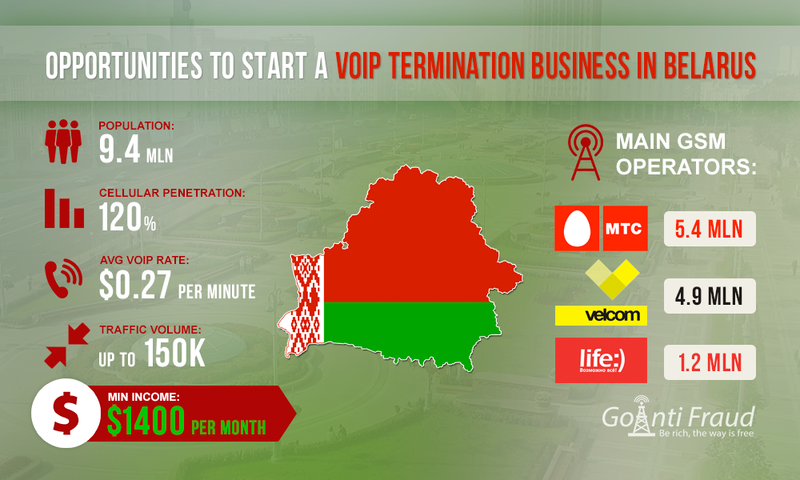 Despite all the above complexities, VoIP GSM termination in Belarus is in high demand. This is not surprising, because the earnings prospects are good: the rate of 27 cents and lower pricing for calls, there is a high level of penetration of cellular communication - 120%. Belarus has a population of 9.4 million people, and GSM covers more than 98.1% of the territory. The country has well-developed telecommunications market, and the quality of communication is very high. As of 2010, every 1,000 local residents had at least 1,022 mobile devices. You can buy SIM-cards in Belarus if you produce your passport. Most operators also require the presence of the registration stamp (i.e. residence in the country). However, the terminators find workarounds to purchase starter packages in Belarus. One SIM-card costs about $3. Rates for local calls are low - about $0.026 but you can find cheaper deals. Thus, the terminator is able to make an average profit of $1,400 per 1 GSM channel. Estimated earnings are calculated taking into account the work of a SIM-card within 3 days, subject to termination of calls for 5 hours daily. Despite the severity of the state in relation to VoIP termination and active AntiFraud systems, you can do terminate in Belarus and make a lot of money. The main thing is to provide reliable protection for your SIM-cards, choose the right location for the equipment and use professional software to simulate the behavior of a real user. To avoid blocking by the ISP, it is recommended to use the VPN server to encrypt traffic. GoAntiFraud is a cloud service for both VoIP GSM termination professionals as well as for start-up entrepreneurs who have decided to start a business in this area. We offer a comprehensive solution to bypass AntiFraud systems, workflow automation and remote control over GSM gateways/SIM-banks. Our company also sells GoIP equipment by EjoinTech & ChinaSkyline for businesses of all sizes. Is It Possible to Do Profitable GSM Termination in Slovakia?